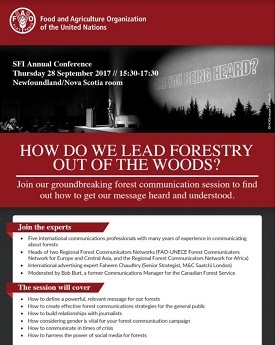 Ottawa, Canada, 28 September 2017 - Forest communicators need effective strategies to capture interest in order to better inform the public and decision-makers about vital issues and messages related to the forest sector, a session on the issue heard during the 2017 Sustainable Forestry Initiative (SFI) Annual Conference in the Canadian capital of Ottawa. The session, “How do we lead forestry out of the woods?”, also examined how best to translate the science of forestry and climate change into plain language in order to reach key audiences. Kai Lintunen, Deputy Leader of the FAO-UNECE Forest Communicators Network (FCN), set the scene for discussions by providing background on the role of forests in dealing with climate change. Lintunen is also Head of International Communications at the Finnish Forest Association. Together with Ingwald Gschwandtl, Leader of the FCN and Director of the Forest Policy Division in Austria’s Federal Ministry of Agriculture, Forestry, Environment and Water Management, he also outlined steps on how to move from providing information to reaching people’s minds. Tapping into peoples’ common emotions can catapult an otherwise abstract message into something more familiar, said Faheem Chaudhry, Senior Strategist with global advertising agency M&C Saatchi who used a case study to illustrate the value of clear, simple messages to connect with audiences. Social media also plays a vital role in communications during a crisis such as ecological conflict, added Barbara Tucker, Leader of the Africa Forest Communicators Network and representative of Working for Forests, Department of Environmental Affairs, South Africa. A solid strategy that brings together such elements provides the basis of good communications, the experts agreed. Maria De Cristofaro, Outreach and Capacity Building Officer for FAO’s Forestry Department, explained how media relations should be given priority in an effective communications strategy. She described how to develop the succinct messages that journalists require, how to deliver these in a timely fashion, and build relationships with the media. A significant challenge facing many communicators is explaining the necessary balance between forest conservation in the climate change context and the sustainable use of wood products and forest resources, the session was also told. Gschwandtl outlined a successful nationwide communication campaign in Austria as a possible template. The communications side event, held during the annual conference of the SFI, was organized by the Regional Forest Communicators Networks with the support of FAO and the governments of Austria and Finland. It was moderated by Bob Burt, former communications manager with the Canadian Forest Service. The six Regional Forest Communicators Networks represent more than 500 professionals worldwide from governments, international and national organisations, and the private sector. Members liaise to improve forest communication and work to develop professionalism among forest communicators. The FCN, which covers Europe and Central Asia, was set up by the UNECE Timber Committee and FAO European Forestry Commission almost 20 years ago. Five other networks based on the FCN model have since been created in Africa (Francophone and Anglophone networks), Asia-Pacific, Mediterranean and the Near East, and Latin America and the Caribbean. A Global Group on Forest Communication was formed by FAO to improve communication on forest issues and facilitate capacity development among the regional networks.